The offensive, announced by Prime Minister Haider al-Abadi, comes four days before a referendum on Kurdish independence due to be held in northern Iraq, including Kirkuk. 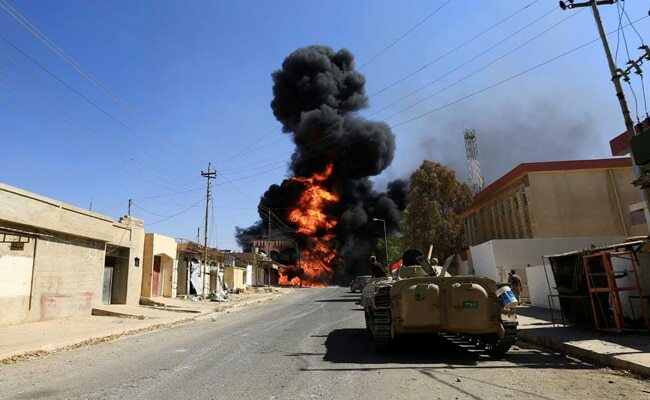 ERBIL, Iraq: Iraq launched an offensive on Thursday to dislodge ISIS from Hawija, an area located west of the oil city of Kirkuk. Abadi considers the September 25 referendum "anti-constitutional" and has called on the autonomous Kurdistan Regional Government to cancel it. Kirkuk is shaping up as a flashpoint ahead of the Kurdish independence vote as it is also home to Arab and Turkmen communities who oppose breaking away from Iraq. Kurdish Peshmerga forces took control of Kirkuk after the Iraqi army collapsed in the face of ISIS in 2014, preventing the terrorists from capturing the city's oil fields. A US-led international coalition is providing air support to the Iraqi forces' offensive on Hawija, Iraqi state TV said. It wasn't clear if the Kurdish plan to hold the referendum in Kirkuk would be affected by the US-backed Iraqi offensive on Hawija, which is likely to cause an outflow of refugees toward the neighboring areas. The United Nations last week said up to 85,000 people could be displaced from the Hawija region. Washington issued on Wednesday a forceful statement against the Kurdish referendum. "The United States strongly opposes the Iraqi Kurdistan Regional Government's referendum on independence, planned for September 25," said State Department spokeswoman Heather Nauert. Hawija, north of Baghdad, and a stretch of land along the Syrian border, west of the Iraqi capital, are the last pieces of the country still in the hands of ISIS terror group. The group overran about a third of Iraq in 2014. ISIS' self-declared "caliphate" effectively collapsed in July, when US-backed Iraqi forces captured Mosul, the group's de facto capital in Iraq. Kurdish Peshmerga fighters took part in the war operations against the terrorists. ISIS also controls territory in Syria, along the Iraqi border but it is shriking fast in the face of a US-backed Kurdish-led coalition and Russian and Iranian-backed forces loyal to Syrian President Bashar al-Assad.